Club Santos Laguna's Djaminy Tavarez tries to work the ball between RGV FC's Zach Wright, left, and Ramilo Hernandez during the second half against Club Santos Laguna Wednesday, July 11, 2018, at H-E-B Park in Edinburg. The Toros won the match 3-0. EDINBURG — RGV FC welcomed 2018 Liga MX Champions Club Santos Laguna to H-E-B Park on Wednesday night. 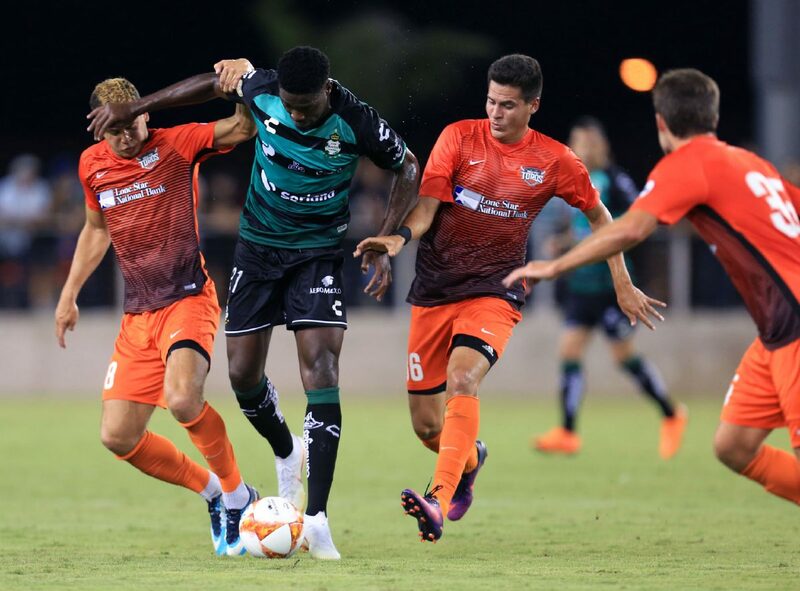 The Toros played well, especially compared to their form in USL action, to earn a 3-0 shutout victory over Santos. It was the third time in two weeks a Mexican club played on an RGV field. Liga MX was again well-represented in the stands with tons of green and white jerseys and plenty of support for the visitors. More than an hour before the 8 p.m. kickoff, fans in the iconic green and white from Laguna lined up to take a picture with their Clausura trophy. Some fans even held up six fingers to signify the six times Club Santos Laguna have been crowned champions. RGV FC's Jordan Jones, right, celebrates his goal with Jesus Enriquez during the first half against Club Santos Laguna Wednesday, July 11, 2018, at H-E-B Park in Edinburg. The Toros won the match 3-0. RGV FC's Jordan Jones pushes away from Club Santos Laguna's Alejandro Castro on his way to scoring a goal during the first half against Club Santos Laguna Wednesday, July 11, 2018, at H-E-B Park in Edinburg. The Toros won the match 3-0. RGV FC's Guillermo Delgado moves the ball past Club Santos Laguna's Alejandro Castro during the first half against Club Santos Laguna Wednesday, July 11, 2018, at H-E-B Park in Edinburg. The Toros won the match 3-0. 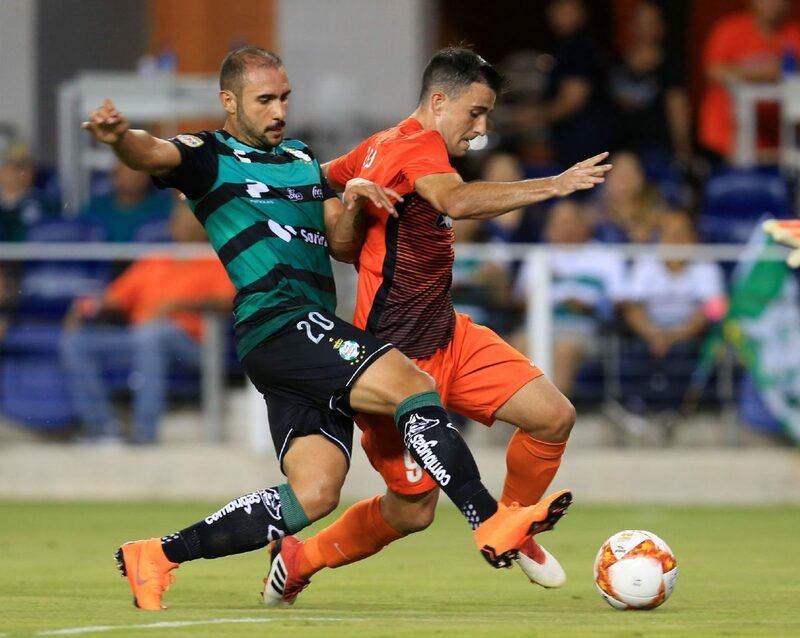 RGV FC's Nicolas Perez moves around Club Santos Laguna's Jorge Gonzalez during the first half against Club Santos Laguna Wednesday, July 11, 2018, at H-E-B Park in Edinburg. The Toros won the match 3-0. Club Santos Laguna's Djaminy Tavarez has his shot saved by RGV FC goaltender Matthew Sanchez during the second half against Club Santos Laguna Wednesday, July 11, 2018, at H-E-B Park in Edinburg. The Toros won the match 3-0. Santos Laguna played on the H-E-B Park pitch earlier this year in a friendly against Chivas back in March. From the first whistle the team with question marks about their offense, RGV FC, were the better, more creative 11 on the field. It didn’t even take half an hour before the Toros turned offense into production. On a free-kick from about 10 yards outside from the 18-yard-box, Guatemalan midfielder Pablo Aguilar sent a curving strike past the outstretched arms of Santos keeper Carlos Acevedo. Aguilar made a beeline to the sideline near his bench. He pointed and showed a heart to his family members who were in the fifth row, all standing in his orange No. 10 uniform. A first-half goal for RGV FC was a rarity, but the surprises didn’t end with Aguilar’s strike. Seven minutes later the Toros did something they had not accomplished since May 9, scoring twice in a match. Jordan Jones took a pass and fought off a defender who was draped over his body. Even with the contact, he got off a strong shot past Acevedo. The two-goal cushion seemed to help the Toros confidence on the field and even on the sidelines. Gerson Echeverry started to make use of the unlimited subs in the friendly match before halftime. Some starters were pulled while players in good form were rewarded with match time. Bryce Marion came on, as did Jesus Enriquez and David Cabrera who replaced his brother Wilmer “Andy” Cabrera. Since the game was a midweek tilt between two USL regular season matches, the coach was careful to consider rest, recovery and availability for their Saturday match against Las Vegas Lights FC. In the second half, where the Toros normally falter, the strong play continued. RGV FC was able to keep the mostly reserve roster of Santos Laguna in check. It wasn’t until the 50th minute that Matt Sanchez was truly called into action to make a key stop, and he did via a kick save. Alberto Ocejo and Jorge Gonzalez, two promising U20 players for Santos Laguna had the best chances for the visitors, but couldn’t convert to send their supporters into the frenzy they were waiting on. 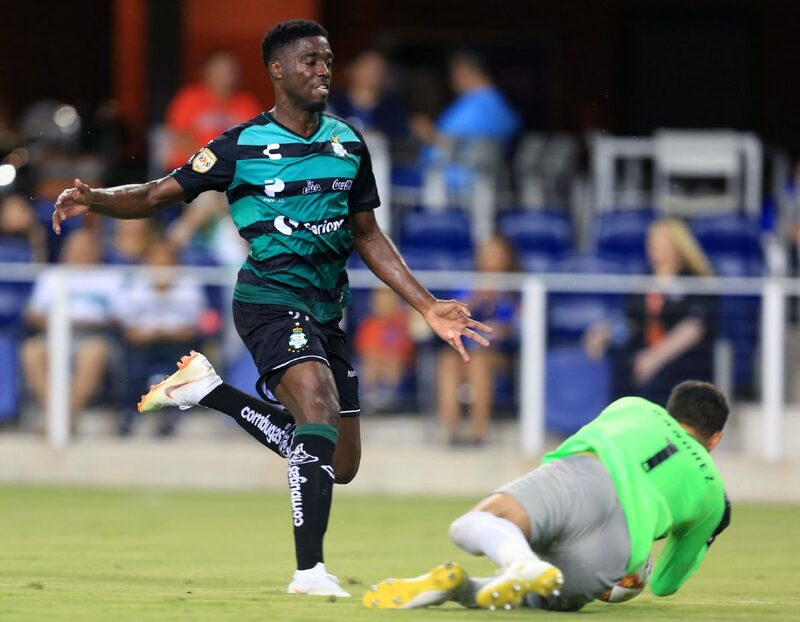 The crowd reacted also in the 61st minute when Santos Laguna brought on some of their starting roster and players that had a big impact on their way to the league title. RGV almost made a notable sub at that point when Toros Academy player Brandon Morales played his first minutes with the senior club. Monday Etim was the third goalscorer for RGV FC. The Nigerian native buried a strong crossing feed from Manuel Padilla to make it a trio of goals in the shutout. The Toros are back in action this Saturday when they host Las Vegas Lights FC and will look to improve their 1-6-10 record and 13 points on the season. Echeverry was pleased with the result, but in no way surprised that his team came out on top.